Are you storing old records or disposing of confidential waste that could compromise your company or your clients? Shred-it secure on site shredding services ensure your confidential information stays confidential, your company stays compliant with privacy legislation, and your business and your clients remain secure. Keep sensitive business data out of the wrong hands by securely destroying it. Shred-it's confidential waste destruction service uses proprietary cross-cut technology and follows strict privacy protocols. Strict in-transit procedures and confidential waste collection ensure nothing is ever trusted to a third party or lost during transport, and no document ever leaves our care. The security of your data is always our top priority. Safeguard your business - and the environment. Our paper recycling programme helps you do your part for the environment. For every two Shred-it bins you fill with paper, you save one tree. We’re proud to report that by using Shred-it confidential waste removal, our clients save more that 9,000,000 trees every year. Shred-it was founded in 1988 and is now the world's leading on site confidential waste destruction company, with more than 140 branches on five continents. Our first UK branch opened in 1999 in Manchester, with additional locations opening in Bristol and Leeds soon after. Today, Shred-it document shredding offers nationwide coverage, with 17 branches across the UK. 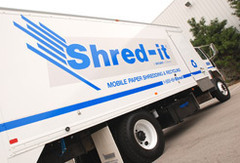 "Our relationship with Shred-it began in 2001 with the move to our new company business centre. At that time we took the opportunity to review the provision of our services, the shredding of confidential waste being one of these areas." In a recent independent survey by Navicom Inc., 93% of Shred-it customers said they would recommend our confidential waste removal services to others. Products or Services: On Site document destruction. Shred-it's secure on site paper shredding process is vastly safer than having confidential materials picked up and transported for off site paper shredding. Your materials are secure from the moment they are deposited into your office's Shred-it container. The locked containers keep documents safe from curious caretakers or cleaning staff. At your convenience, a security vetted and insured Shred-it Customer Service Representative (CSR) unlocks the container and carries your materials to a waiting vehicle outside. Your materials need not be entrusted to more than one company or person; our CSR replaces all duties otherwise assigned to your office's paper collector, the driver of the vehicle carrying your confidential materials, plus the off site paper shredding facility's warehouse staff, paper sorters and shredders. Materials are shredded at your premises, behind bolted doors on our truck (although you are welcome to witness your confidential documents being destroyed). We then issue a Certificate of Destruction that confirms the destruction of your confidential materials.